Raising a Super Dog - moved to rasuperdog.com: Wordless Wednesday: Help it or eat it? Wordless Wednesday: Help it or eat it? I don't know, says Yaxley. It's rolling around like it banged its big toe or something. And those noises! I can't tell if the critter is laughing or saying naughty words in Dothraki. What should I do, Food Lady? Do I try to help it or maybe just eat the thing to end the suffering? Yaxley, my love, I say. You leave it. 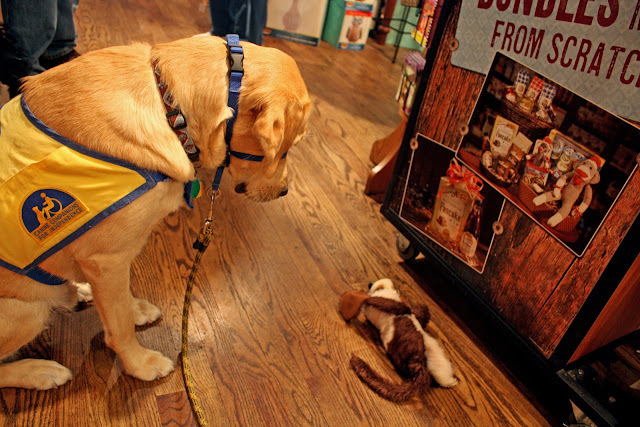 A never-before-published photo from the puppy raising archives has Yaxley observing a battery-operated toy in Cracker Barrel's strategically placed gift shop. You know their floor plan, right? It'll be a fifteen minute wait, says the hostess. Feel free to shop around until your table's ready. And the photo above is not a demonstration of how to torment a pup, but instead just another training exercise. We have a novel object that is doing its level best to appear like injured prey, with all the squeaky sounds and twisting about. And Yaxley held tough, the good boy. Showing us some nice self-control here, our little yeller feller. Which reminds me to advise you to not waste any time looking for photos of the mighty Micron performing this task. They do not exist for our impulse-control challenged guy. That is incredible self-control! Awesome job, Yaxley! Happy WW! Thanks Sarah, this was just before he started the Advanced Training program at CCI. It was a nice proofing exercise. What a good puppy, that Yaxley. Yaxley, I am so impressed. Luna and I are starting training next week. Hopefully she will be half as self-controlled as you! Hi Jessica! We wish you good luck as you and Luna start training together. We adopted a rescue, Jager, who surprised us by becoming the most amazing dog. We truly didn't see his full personality at first. He was holding back until he found he could totally trust us. Adopting adult dogs can be the best choice in so many ways. Enjoy each other! That's pawsome! What great restraint! And this in reason number three why I do not eat at Cracker Barrel. Dare I ask about reasons one and two? No, I'm afraid. Cracker Barrell is one of my favorites comfort food joints (hash brown casserole!). And they are consistently welcoming of the pups in training. Ok, you can tell me. Just leave out anything that involves ill prepared foodstuffs, please. I don't want to lose that innocence. Wow cute pic! Are you joining us for BlogPaws in May? Holy cow, I love BlogPaws! I've been trying to work out a schedule conflict, which frankly, has not been going in my favor. Paws crossed things work out. My dog would have been tilting his head from side to side trying to figure the 'toy' out. Hey Marcie, a belated Happy WW to you. I love the head tilt thing. Even though it causes me to make funny noises in public settings just to see a pup's adorable reaction.